The page here on my blog labelled "Biographies" has four of my books profiled. The most recent one is from Five Rivers Publishing -- King Kwong, a biography of Canadian hockey player Larry Kwong. If you're a hockey fan, you'll find plenty of hockey history in this book to catch your interest! Also included on the Biographies page are two books for a series from Greenwood Publishing. All of the titles in this series are telling about the lives of celebrities and famous people. The two I've written are on Lady Gaga and Lance Armstrong. One book on each of 'em, I mean. I don't think there's even a rumour linking these two famous people, and it would be hard to write TWO books about a rumour. The fourth book is for a series from Rosen Publishing, and it profiles author Will Hobbs. If you're looking for YA fiction, this is a name to find in your bookstore or public library. His heroes are virtuous, and in his adventures there is plenty of excitement with very little violence. It's interesting to be writing biographies. 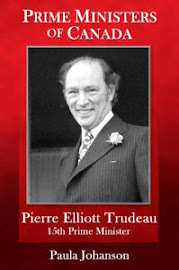 Recently I finished one on Pierre Elliott Trudeau, and I'm working on another about Charles Tupper, both for a series on Canadian Prime Ministers. It's not only famous lives that are noteworthy, though. When I teach writing workshops there are so many people working on a story or a book about the lives of their parents, or grandparents, or other relatives or themselves. Ordinary lives are worth living, and they're certainly worth reading about.